2nd Generation — Mother of J.P. Morgan, Jr.
John Pierpont "Jack" Morgan Jr.
1 Find A Grave, (accessed 03/19/2013). 2 Roberts, Gary Boyd, Notable Kin, Volume 1 , Santa Clarita, California: Carl Boyer, 3rd (1998), 23. 3 Roberts, Gary Boyd and William Addams Reitwiesner, American Ancestors and Cousins of The Princess of Wales, Baltimore: Genealogical Publishing Co., Inc. (1984), 49, Ancestry.com (Online Database). 4 Starr, Frank Farnsworth, The Miles Morgan Family of Springfield, Massachusetts, Hartford, Connecticut: Tuttle, Morehouse and Taylor Company (1904), 54, Heritage Quest (Digital Library). 5 Tracy, Evert E., M.D., comp., Tracy Genealogy: Ancestors and Descendants of Lieutenant Thomas Tracy of Norwich, Conn., 1660, Albany, New York: Joel Munsell's Sons, Publishers (1898), 161, 210, Google Books (Digital Library). 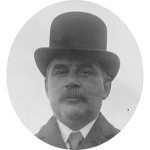 6 Wikipedia, "J.P. Morgan, Jr.", (accessed 03/19/2013). 7 Wikipedia, "J.P. Morgan", (accessed 03/19/2013).